Note: This guide is only relevant for the consumer version of the Shrimpy application. The Shrimpy Institutional platform combines exchange accounts, so they are not managed separately. The Shrimpy application provides the most simple way to manage each and every one of your exchange accounts, through a single interface. The way Shrimpy manages each of your exchange accounts may be confusing at first, but with a few pointers, it should become clear. We have done our best to divide accounts in a logical way once you get a grasp of our thought process. 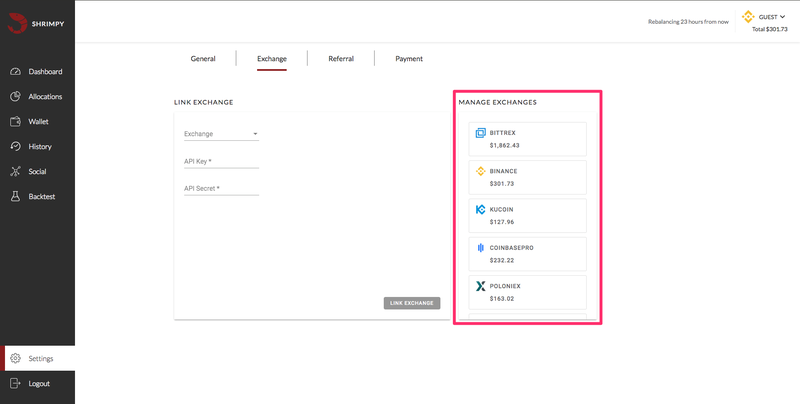 We can see in the above image that we are able to link multiple different exchange accounts on the "Exchange" page in the "Settings" tab. Although this image only displays a single instance of each exchange, you are also able to link more than one of the same exchange. Whether you want to link 1 Bittrex account or 25, it's possible with Shrimpy. Each exchange account that you link will show up in the box that I have highlighted with the pink outline. This may be the most confusing part when trying to understand how Shrimpy manages each exchange account. Once we have a good grasp of this concept, we should be in the clear. The top section of the left navigation bar is specific to each exchange account. This section is highlighted by the pink box (on the left). Every tab in this box only applies to the single exchange account you are viewing at this moment. 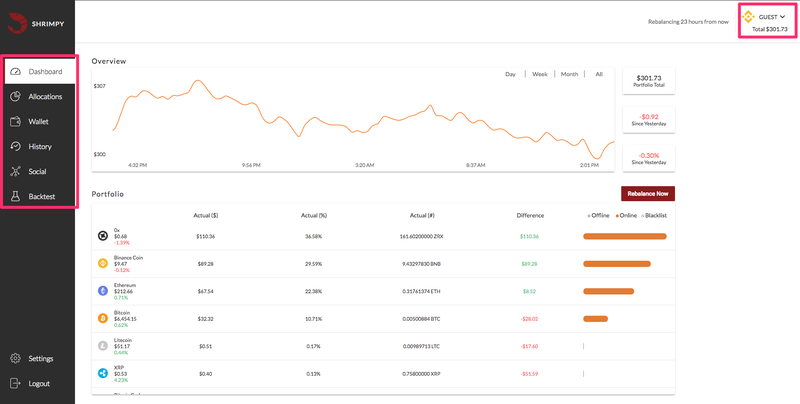 You can see which exchange account you are viewing at any time by looking at the top right corner. I have placed a pink box around the drop down menu which will tell you the current exchange you are viewing. In this case, we are currently looking at our Binance exchange account that has $301.73. So, all of the tabs on the left only apply to that account. It should also be noted that the bottom two tabs, which are not in the pink box, do not apply to any specific exchange. They apply to ALL exchanges. This means if I have linked 25 exchanges, updating something in settings will apply to all of those exchanges (or more generally to your Shrimpy account). In a similar way, selecting "Logout" will log you out of your Shrimpy account. 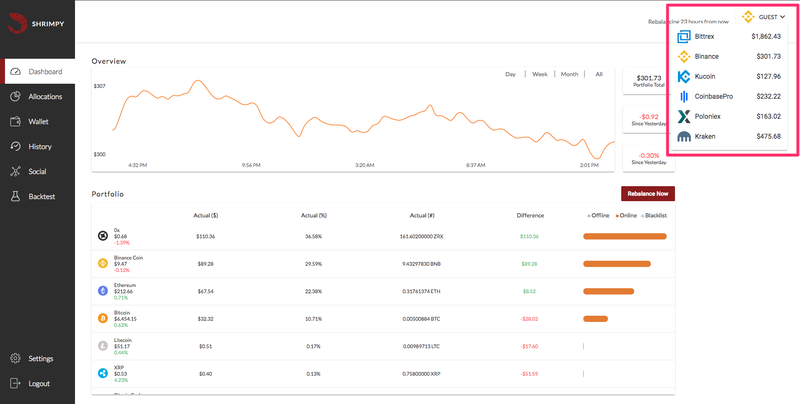 Dashboard - The "Dashboard" tab will only show the portfolio value and assets which are owned on the one exchange account that you are currently viewing (as determined by the dropdown in the top right). Allocations - The "Allocations" will only be specific to the current exchange you are viewing. Wallet - The "Wallet" tab will only apply the "Cold Storage" assets and "Blacklists" that are input to the exchange account you are currently viewing. History - The "History" tab will only show the history for the specific exchange you are currently viewing. Social - The "Social" tab will only show leaders who are on the same exchange as you. This means you cannot follow or even view leaders who are on other exchanges. Backtest - The "Backtest" tab allows you to only backtest assets and data which is on your exchange. The data is exchange specific, so you may get different results on different exchanges even when running the exact same strategy. Continuing from the previous discussion. If we click on the "Allocations" tab, we will notice that it still applies to the same account we were looking at on the "Dashboard". So, even though I have changed tabs, I am still looking at our Binance exchange account which holds $301.73. We know this because the top right corner still tells us which exchange account we are looking at right now. Therefore, if we want to change our allocations, we will select our allocations and save them for this one exchange account. Selecting allocations does not apply across all of your exchange accounts. It only applies to the current exchange. 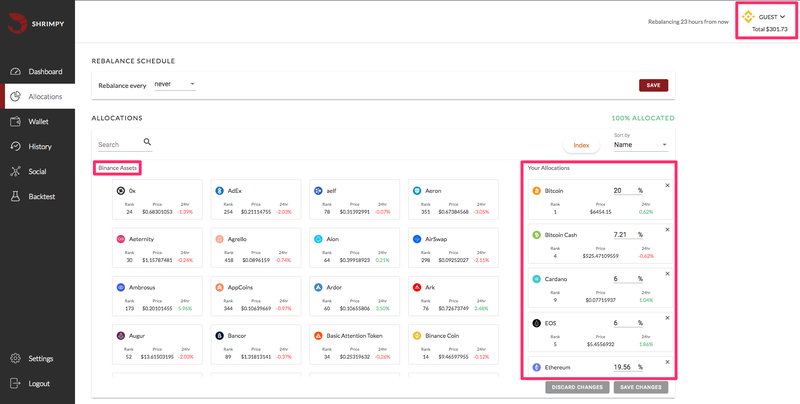 You will also notice that it says "Binance Assets" on the left side (highlighted by the pink box), to clarify that the assets you are selecting are only available on the Binance exchange (since we are looking at our Binance exchange account right now). Now that we have configured one of our exchange accounts, we can switch to one of our other exchange accounts. This can easily be done by selecting the dropdown in the top right. Selecting the dropdown will display all of the exchange accounts that you have linked. You can then select which one you would like to switch to view. Once you select one of your other exchanges, the tabs on the top of the left navigation bar will instantly switch to being relevant to the exchange account you selected. This means the "Allocations" tab will be specific to the new exchange account you selected, the "Dashboard" will only show assets owned on the new exchange account, and so on. After we have selected a different exchange account to view. 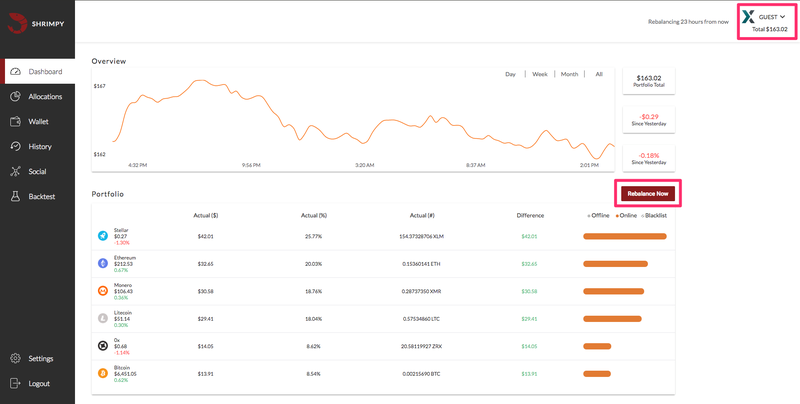 We can see that the dashboard changes to be specific to the new exchange. In this case, we have selected our Poloniex exchange. If we want to rebalance our Poloniex exchange account, we can then select the "Rebalance Now" button when we are viewing our Poloniex exchange account. This will then immediately rebalance this single exchange account without affecting any other exchange accounts. The Shrimpy team tried to make a clear separation between each exchange account. This was done by making all of the top tabs in the left navigation bar always specific to the one exchange account you are currently viewing. The exchange account you are currently viewing can be found by looking at the top right drop down. Whichever exchange account you see displayed in the top right is the exchange account all of the top tabs apply to. Similarly, the bottom tabs in the navigation bar apply to every exchange account. These are global Shrimpy settings and configurations. Changing these settings will apply to all of your exchange accounts. Grasping these two major points will allow you to quickly navigate Shrimpy, make changes to each of your accounts, and become a master at managing your exchange accounts.